PHOTO BY JILL GOSCHE Law enforcement officers work at the scene on US 224 Thursday. A woman in custody was flown by Life Flight after jumping from a vehicle on US 224, between SR 100 and SR 231, Thursday. 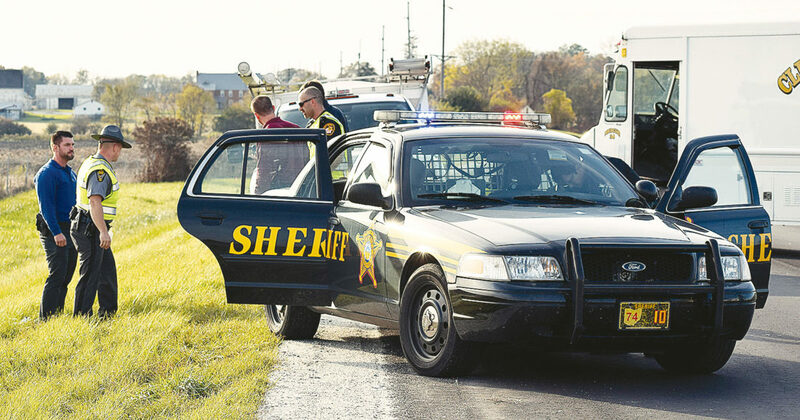 Seneca County Sheriff Bill Eckelberry said Jessica Poole, who had a hearing in Tiffin-Fostoria Municipal Court Thursday, was taken by Life Flight to Mercy Health – St. Vincent Medical Center in Toledo with head injuries. Eckelberry said Heidi Ramirez, a Tiffin-Fostoria Municipal Court probation officer, was transporting her from Fostoria to Seneca County Jail. He said Poole was able to open the door. It didn’t appear the child locks were activated to prevent her from opening the door, he said. “(She) jumped out of the vehicle,” he said. Tiffin Fire Rescue Division, Clinton Township Volunteer Fire Department, State Highway Patrol and Seneca County Sheriff’s Office responded.